Leave Kayakoy this morning and drive to Xanthos, which was the capital of ancient Lycia and at one time the largest centre of commerce and religion in the region. It has had a turbulent past, falling to the Persians and then the Romans and on both occasions this sadly resulted in the mass suicide of the entire town's population. In Byzantine times, the city walls were renovated and a monastery was added, but the city was finally deserted after Arab raids in the 8th century. Today it is a UNESCO World Heritage Site. 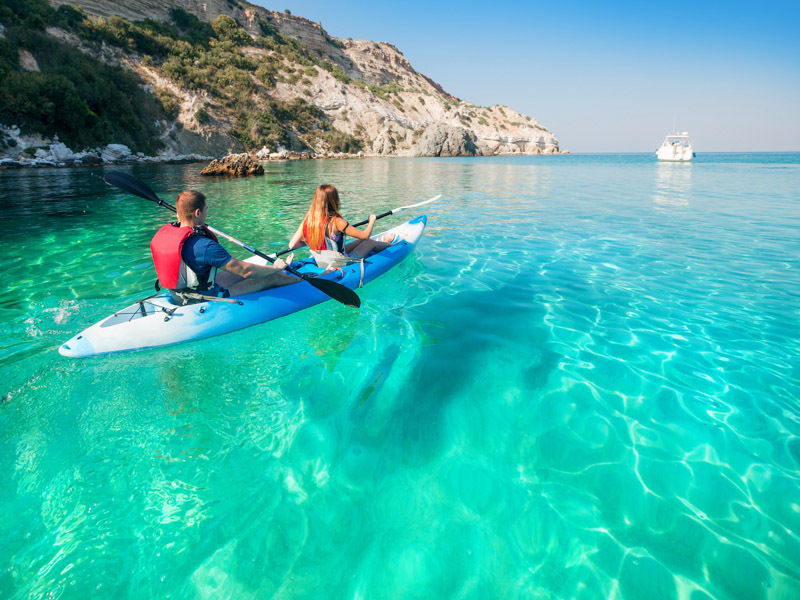 After exploring Xanthos, take to the water for a four hour canoeing trip down the Xanthos River to Patara Beach with a stop made for a riverside barbecue lunch along the way. Passing through the tranquil and unspoilt rural backwaters those with keen eyes can spot colourful kingfishers, egrets, grey and squacco herons and also terrapins on the riverbanks. Emerging at Patara Beach there is time to relax and swim. The 18 kilometres of golden sand is one of the longest beaches in Turkey and is a protected nesting area for giant loggerhead turtles. At its eastern edge there's also the ancient city of Patara. Once the principal port of ancient Lycia, and birthplace of the 4th century bishop of Myra, Saint Nicholas - better known as Father Christmas. Arriving in Kas in the evening and check-in to the central located hotel for the next five nights. Conveniently situated just a few minutes' walk uphill from the centre of Kas, the hotel affords views down towards the harbour. It's equipped with an outdoor swimming pool with sun loungers, a poolside bar, a restaurant with terrace and Wi-Fi is available. 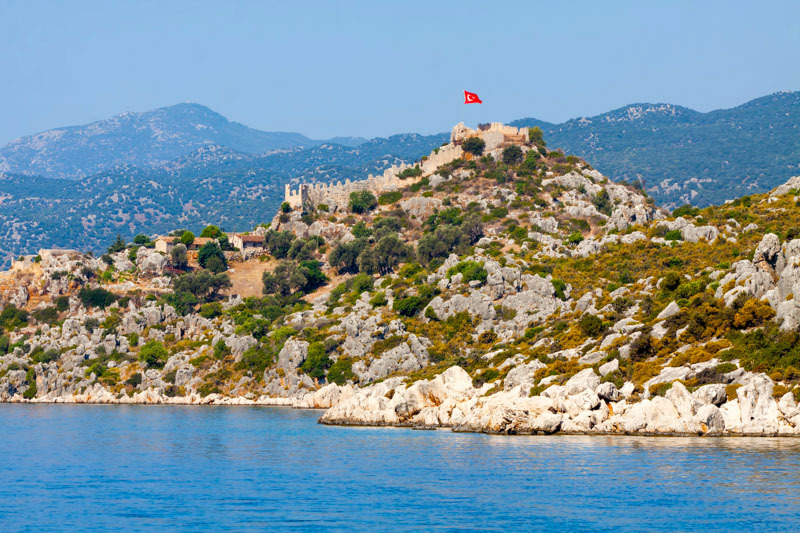 Kas is one of the most beautiful ports on the Turkish Riviera with a dramatic backdrop of steep limestone cliffs. It's a great place to relax, with cafes and restaurants spilling out onto cobbled streets and a network of tiny back-alleys to explore. Making an early start today to enjoy sea kayaking in the tranquil and protected bay of Kekova before any other boats or kayakers take to the water. It's one of the most scenic areas in Lycia; a set of picturesque islands, bays and small ancient cities. It's also home to the so-called sunken city of Kekova, which is the result of various earthquakes that have partly submerged the streets and buildings, which are now visible in the crystal clear waters and there are even steps leading down into the depths of the bay. The time spent kayaking today will be around three hours. We kayak to the picture-postcard village of Simena, whose harbour is dotted with ancient sarcophagi (tombs) and Roman baths and houses that cling to a hillside beneath a medieval castle. Hiking up to the castle, there's a tiny ancient theatre (the smallest in Lycia, with a seating capacity for about 300 people) within its walls. Carved from the solid rock, it is a wonderful place to sit and soak up the serene surroundings. 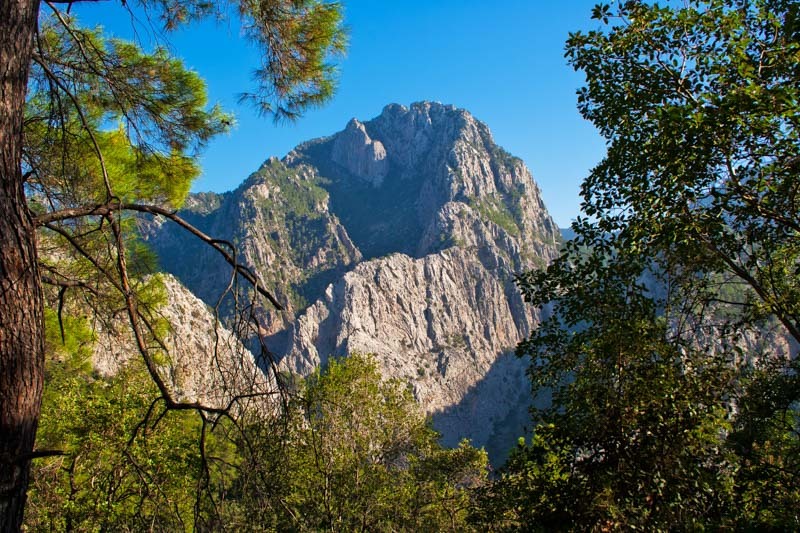 There's the opportunity to have a tasty lunch of meze and grills at a waterside restaurant, before taking to the waters again, paddling through a labyrinth of rocks, passing the shoreline necropolis of Teimiusa to reach Ucagiz. From here we drive back to Kas where the rest of the afternoon is free to relax and discover the town and it's pebble beaches. Today is left free for independent exploration. For those with a hankering for culture, Kas is built around the remains of ancient Antiphellos and there are ruins of a Hellenistic theatre, the monumental Lion Tomb and some hillside rock tombs scattered in and around the town. 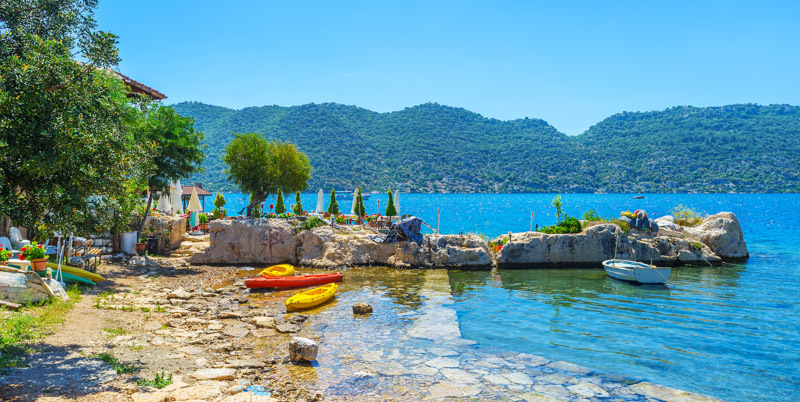 For the adrenaline junkies there are a number of more active pursuits available including horse riding and also the sea around Kas is home to excellent diving locations that cater to all levels of expertise. Alternatively, perhaps take the opportunity to join an excursion to the Greek island of Meis. The island is just 2.5 kilometres from the Turkish coast and yet more than 100 kilometres from Rhodes, its nearest Greek neighbour. Kastellorizo is an idyllic seafront town with colourful buildings lining the harbour where yachts and fishing boats dock. The surrounding hills are home to typical Greek whitewashed building with terracotta coloured roofs. After a leisurely start this morning, walk down to the harbour to board a private wooden gulet boat for a ride along Turkey's Turquoise Coast and a day of pure relaxation. The gulet is hand built in teak and pine, with a spacious and partly shaded foredeck and comfortable indoor and outdoor lounge areas. Cruising through the calm bays around Kas regular stops will be made for swimming and snorkelling in the clear and warm waters of the pleasant bays and rocky coves. While snorkelling, as well as seeing sea life, it may be possible to spot an ancient amphora (vase) lying on the seabed. In the early afternoon the crew cook up a delicious barbecue lunch. Collecting the main luggage upon docking back in Kas and boarding the bus for the journey back to Kayakoy; which takes around one hour. The final night will be spent back at the hotel used on day one of the trip. 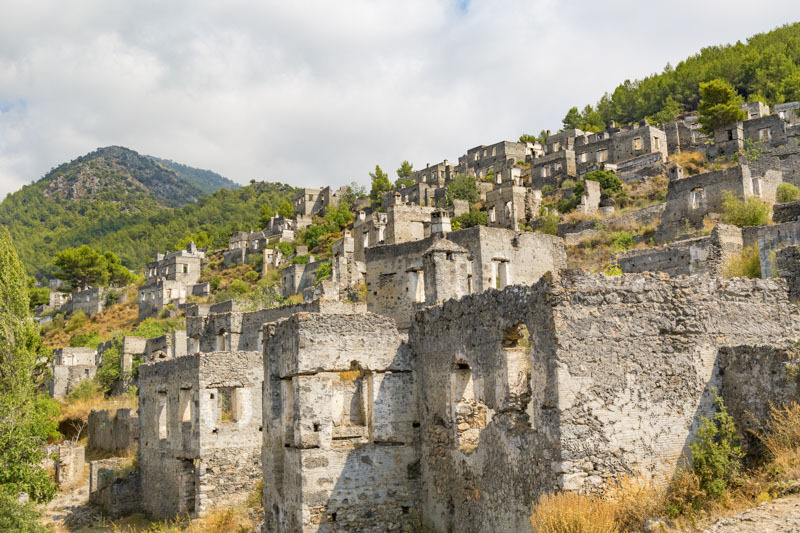 This evening there will be the option to take a walk around the deserted Greek village of Kayakoy. Dominating the mountainside that overlooks the village, Kayakoy has fallen into ruin since the exodus of the Greeks in 1923. Today its ghostly buildings cast a strange profile against the sky. Over the final dinner at the hotel there's the chance to recount all the fun had on this adventure packed week.